Some cities stand out more than others when it comes to their style score — they are a shopper’s paradise and a fashion blogger’s haven. 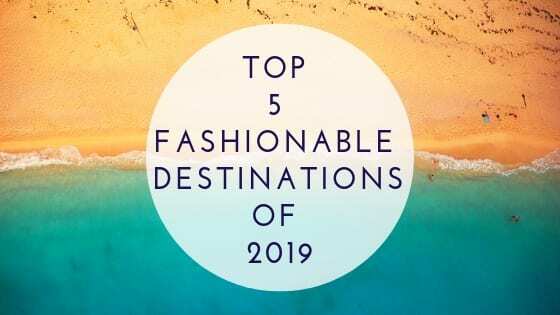 Together with Frank Wright, experts in male fashion and retailers of brown chukka boots, we look at what makes them top destinations and how much it’ll cost you to visit. Famous for its picturesque waterways and scenic canals, Venice gives off vibes of luxury and class. Traditionally, the local craftsmen specialised in creating delicate masks that are worn for the Carnival of Venice and for their glass-blowing techniques. But, the Italian city is now becoming an attraction for fashion lovers with its prestigious showrooms and ateliers of big designers. If you’re looking for designer boutiques, head towards St Mark’s Square, look out for the streets Calle delle Mercerie or Calle Larga XXII Marzo and shop to your hearts content. Discover charming side streets where you can buy custom made Venetian slippers and other garments unique to the city. Venice ranked lesser than the other destinations according to Zalando due to its lower number of fashion schools in the city and their rankings. Vienna is the 3rd most elegant city in the world. It lost some points due to their lower number of fashion weeks, expos and designers who have resided in the city. The capital of Austria sits in the east of the country and is well-known for its elaborate palaces and historic buildings. You can find international luxury brands in the centre of the city, for example at Tuchlauben — a shopping area that is part of the Goldenes Quartier. For local designer garments, make your way towards Neubaugasse and Kirchengasse. Vienna is also home to the famous Lindengasse fashion mile — a street of small boutiques offering stylish fashion in the form of independent brands. Discover local designer garments around Neubaugasse and Kirchengasse. Florence has become more of a trendy city in the past decade — with more people discovering the wonderful art museums, colourful architecture and quaint shopping streets. The Italian city is home to big names such as Gucci and Salvatore Ferragamo as well as other big-name boutiques which can be found at Via Tornabuoni. Discover many local markets and tanneries in Florence — many of which are from a family of traders who have been creating leather goods for centuries. Find yourself an accessory that’s truly unique. There’s also the unmissable Ponte Vecchio for jewellery lovers — discover pieces set with precious gemstones that you’d struggle to find anywhere else. See panoramic views of the city from rooftop bars such as The Grand Hotel Baglioni and the Torre Guelfa Hotel. Capture perfect shots of Florence from these spots whilst you enjoy a drink and soak up the atmosphere. If you’re looking for quirky bars and restaurants to enjoy, London has it all. From enjoying a panoramic view of the city at The Shard to heading to smaller cocktail bars such as the award-winning Dirty Martini in Islington — this destination has something for everyone. Home to the Queen and some of the biggest designers in the world, it comes with little surprise that London has made the top cut. And, when it comes to the finer things in life, how could one forget Harrods? Seven floors and 330 departments dedicated to the only-the-best products in food, fashion, homeware and more. For outdoor browsing, head over to Bond Street for exclusive brands, designer fashion or Mayfair for luxurious goods and super exclusive restaurants. Considered to be the city of love, it’s impossible to believe that you’re in any old city when you’re strolling around Paris. If you’re looking for one-of-a-kind boutiques, head over to the famous Champs-Élysées which stretches from the place de la Concorde to the Arc de Triomphe. To get the full Parisian experience, head to rue Saint-Honoré which boasts the perfect balance of classic designers and Parisian concept stores. Zalando ranked Paris first due to its high perception from fashion journalists and the number of events, expos and more that the city has been host to. Paris is lined with trendy neighbourhoods, including Montmarte — an area with a rich history and culture tucked away on a hill in the north of the city.